Somewhere in the west coast enjoying lunch with Arden milk. 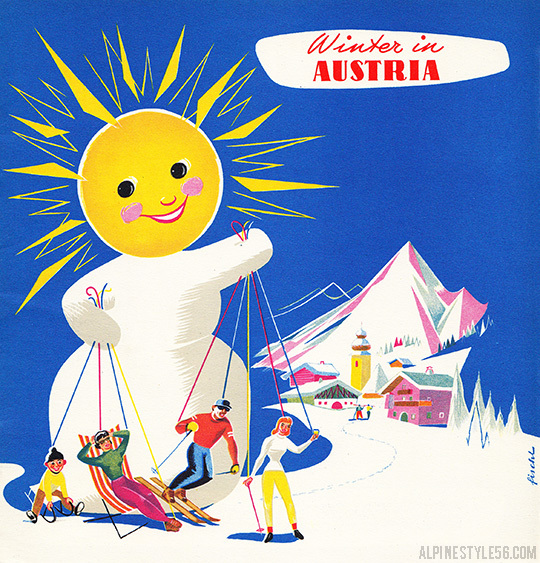 Check the travel posters on the building – excited to recognize the Austria image by Paul Aigner as found at Brimfield! 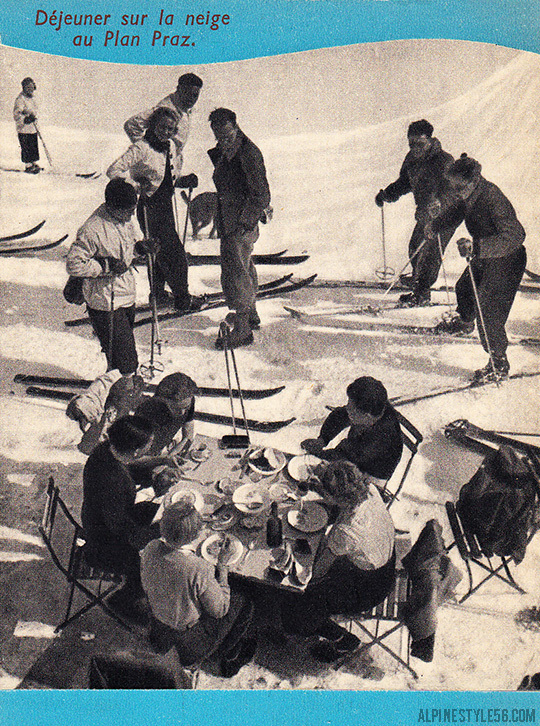 Déjeuner su la neige au Plan Praz. Chamonix, France. 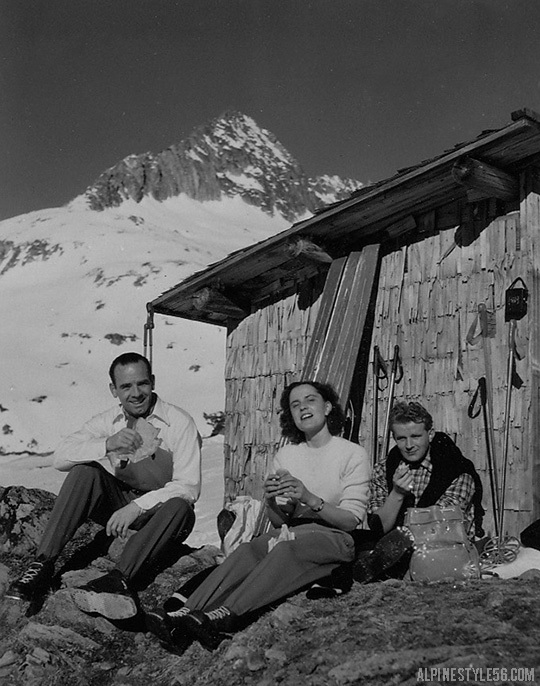 Refueling and relaxing al fresco in the Alps. 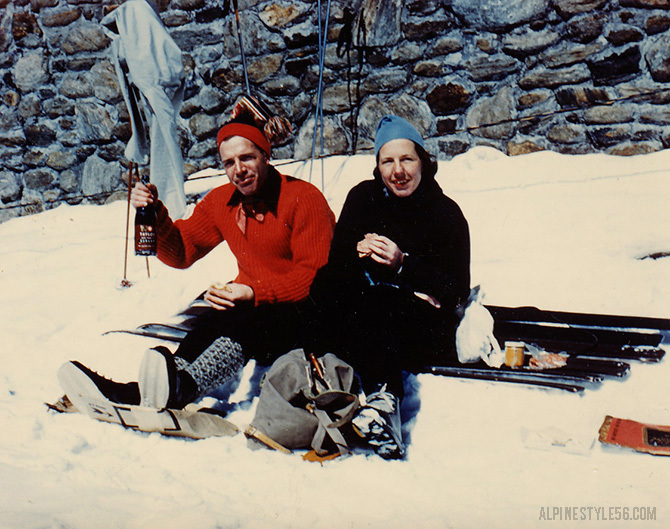 Outside the Stone Hut on Mount Mansfield, Stowe, Vermont. Cheers! 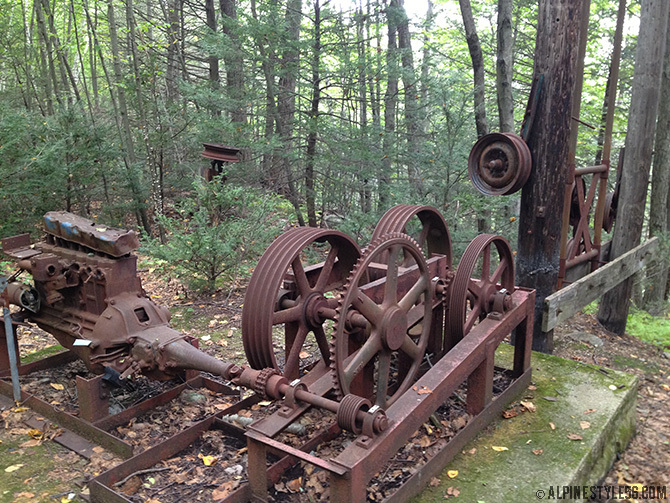 A busted mountain bike and the ensuing trip to a different bike shop resulted in an impromptu hike around Sweetheart Mountain in the Collinsville village of Canton, Connecticut. 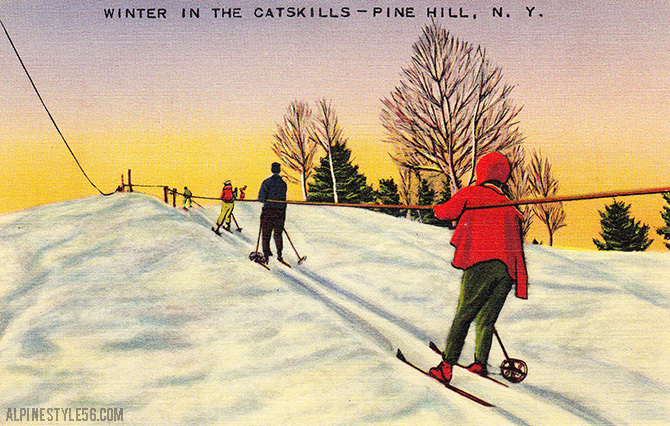 The Canton Ski Club operated this ski area from 1948 to 1974/75. 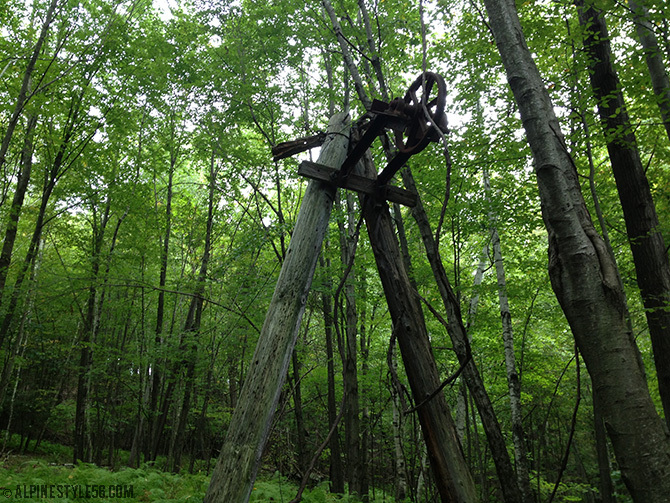 Two rope tows and lights serviced the 400’ vertical – including some surprisingly steep terrain. 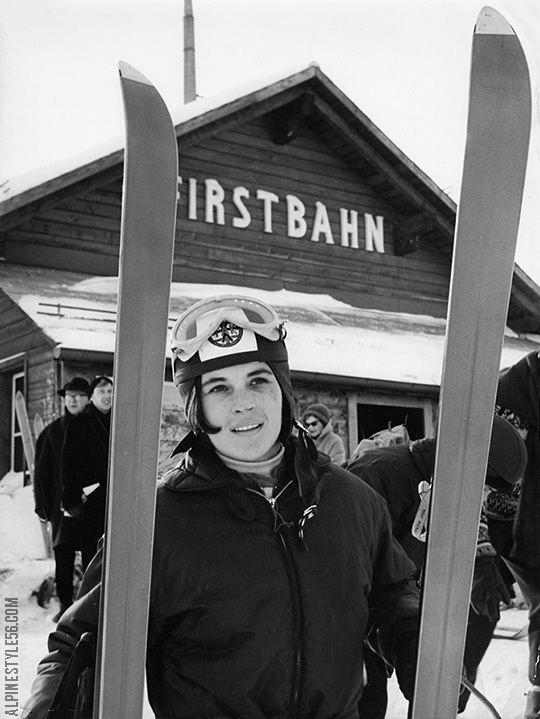 The little ski area claimed as many as 600 members, a dozen ski patrollers and a record 50 operating days in a single season. 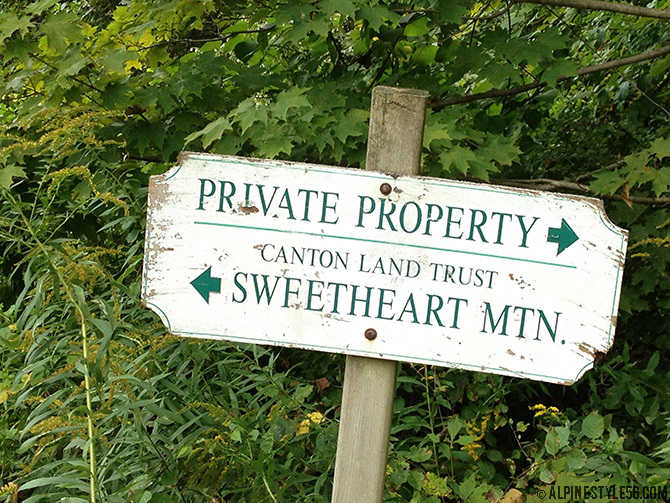 The Canton Land Conservation Trust now owns the property and maintains hiking trails open to the public. 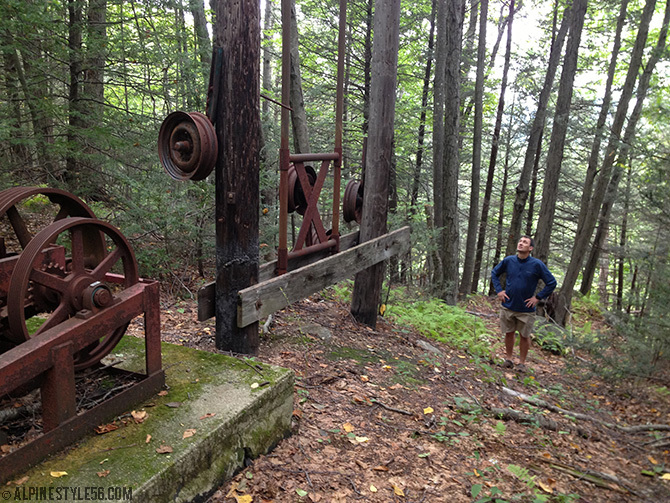 Because so many rusty remnants of this former ski area are still hiding out in the woods – this short hike was a fun and nostalgic exploration. 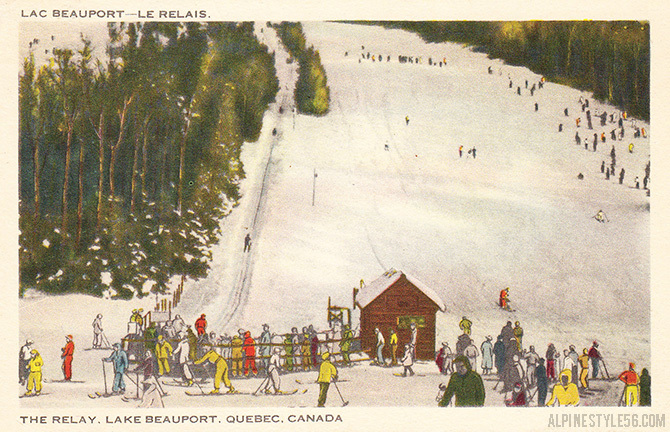 Please visit the NELSAP (New England Lost Ski Areas Project) web site for more detailed information and photos. 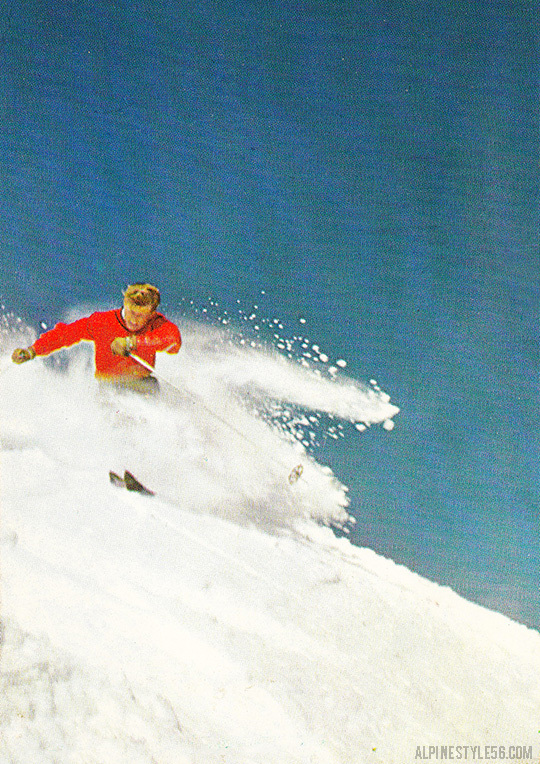 And click to watch a video tour of skiing this lost area. 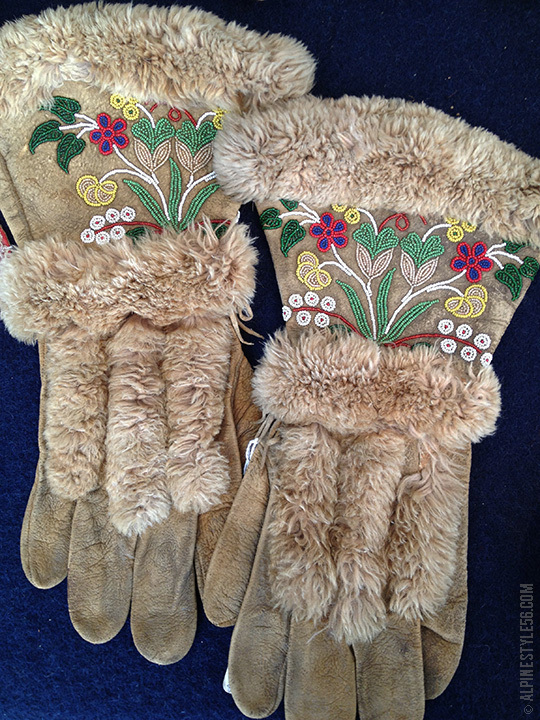 x These gloves are believed to be Athabascan (Athabaskan) from western Canada. 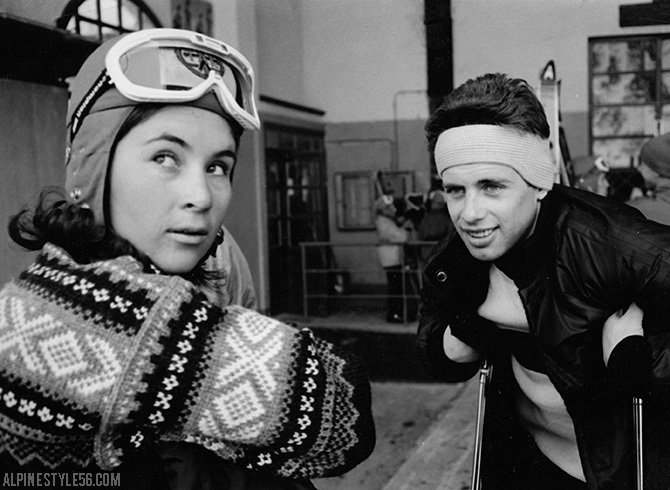 The smaller gloves are sized for a child. 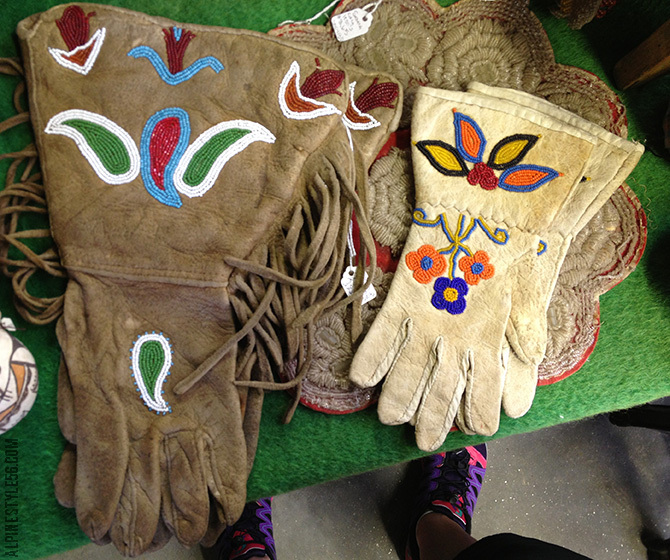 I just can’t get enough of these vintage Native American gloves seen recently at antique fairs. 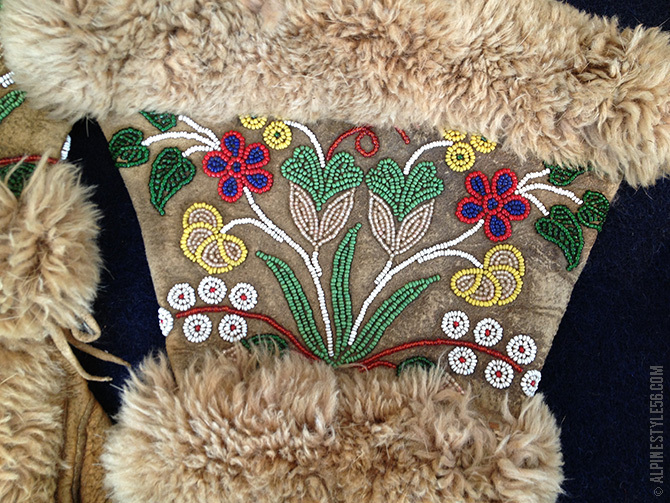 I have never felt anything like the buttery softness of the leather and fur and delight in the pretty beadwork. 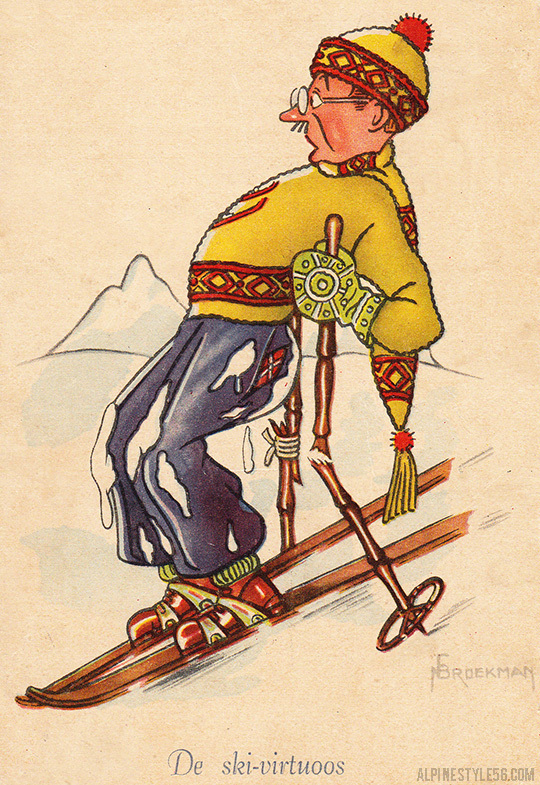 The combination of artistry and utility produced a remarkable result. 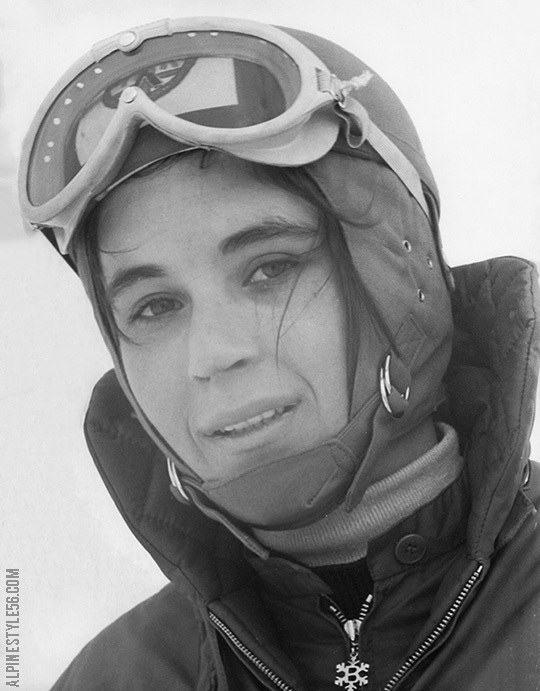 Certainly gloves like this serve as inspiration for Astis and I am looking forward to ski days in my cozy mitts this winter. 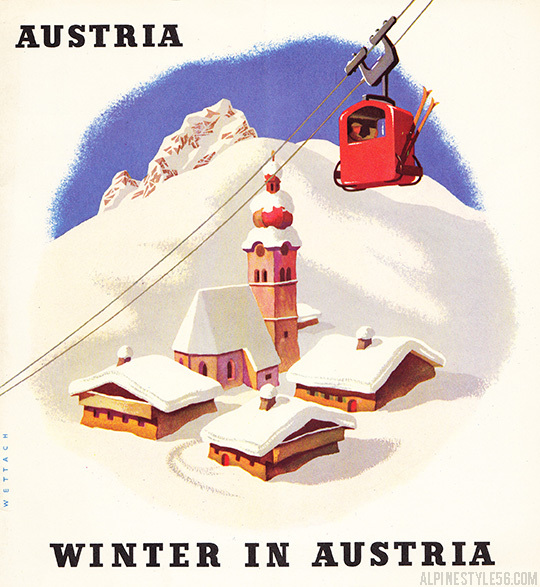 Click to check out the new Astis models for Winter 2013/14. 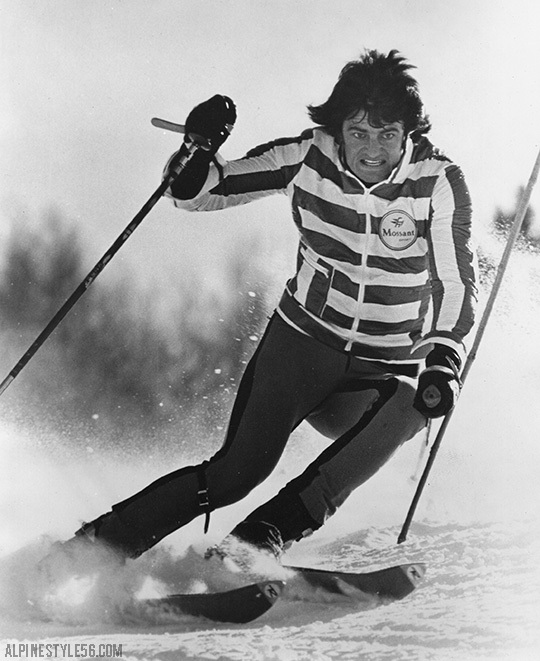 Malcolm Milne of Australia going for it in a striped Mossant Sport of France jacket. 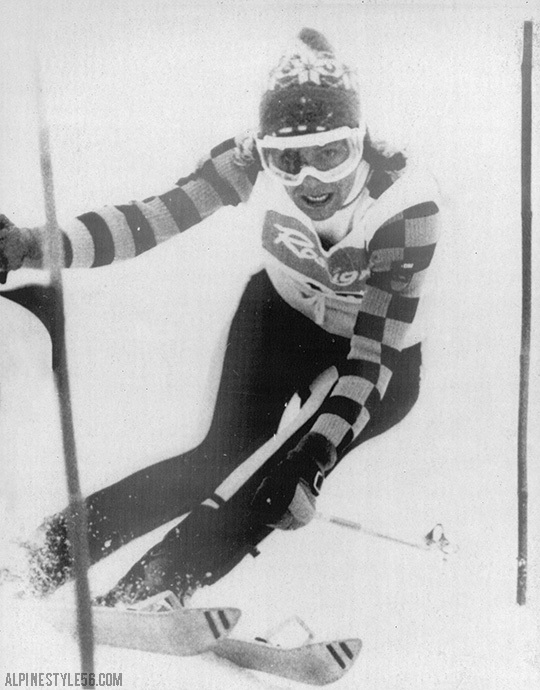 2/27/1974 AP Press Photo: ABETONE, ITALY – Rosi Mittermaier of West Germany flashes through the gates Wednesday to win the World Cup Special Slalom race at Abetone, Italy. 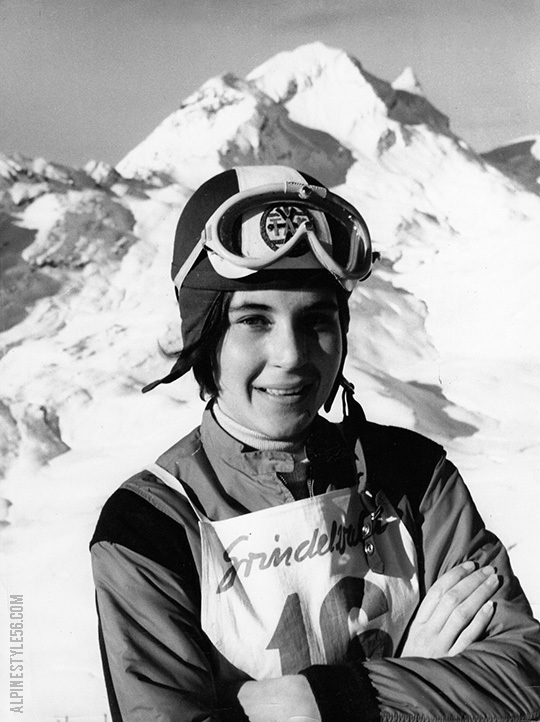 Click to watch Rosi win two golds (DH, SL) and a silver (GS) at the 1976 Innsbruck Olympics; watch to the end to see more fantastic sweaters! 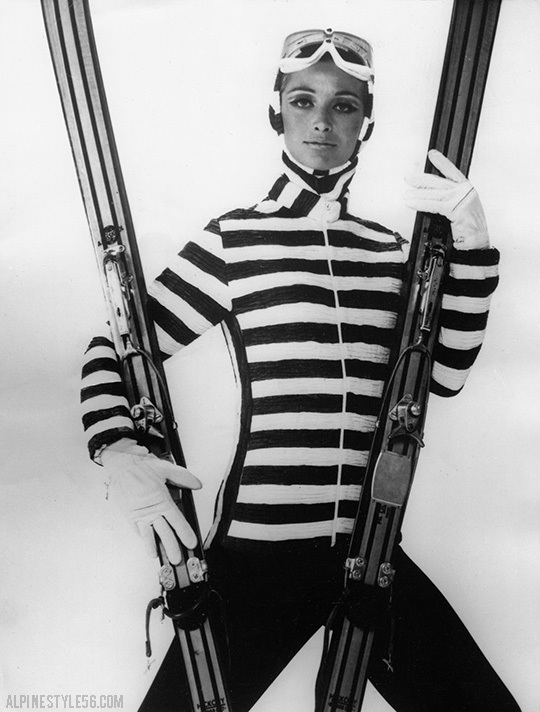 10/28/1965 Press Photo: PARIS FASHIONS: Ski-ing outfit designed by a Paris dressmaker specialized in sports wear. 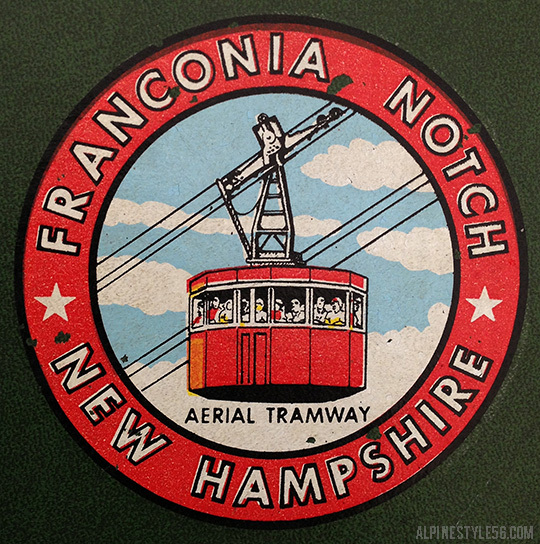 I hit a small local antique fair over the weekend and managed to score a few solid finds. 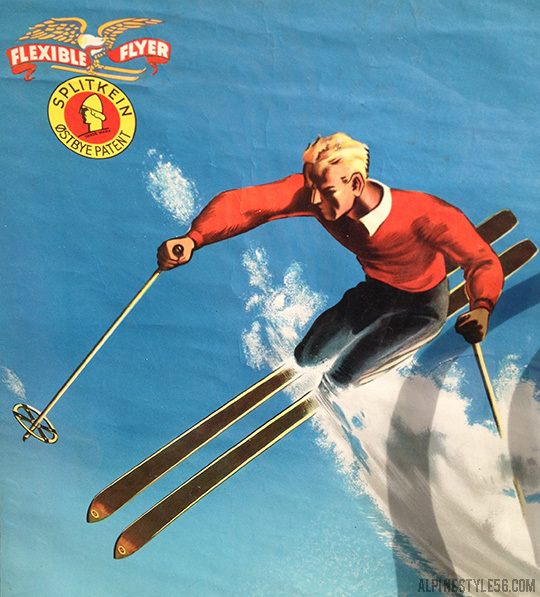 It is a very big treasure hunting week with the final Brimfield show of 2013 starting today. 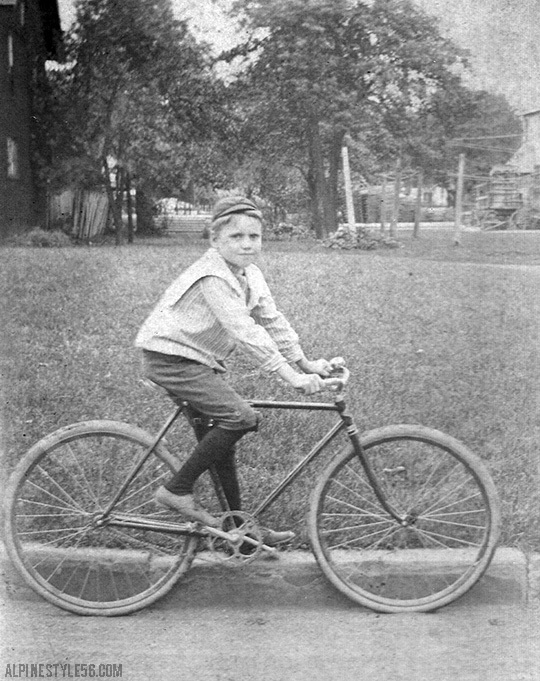 I try to keep my collection exclusively ski or winter images but this vintage bike photo is too good to have left behind. Gorgeous Native American leather gloves with beadwork. Too pricey to buy but a happy reminder that in just a few months I will be skiing in my Astis mitts! 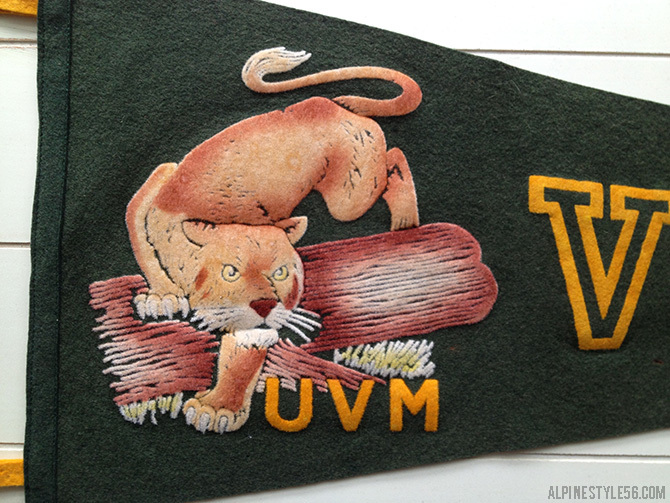 I can’t recall ever coming across any vintage memorabilia from University of Vermont, my alma mater. 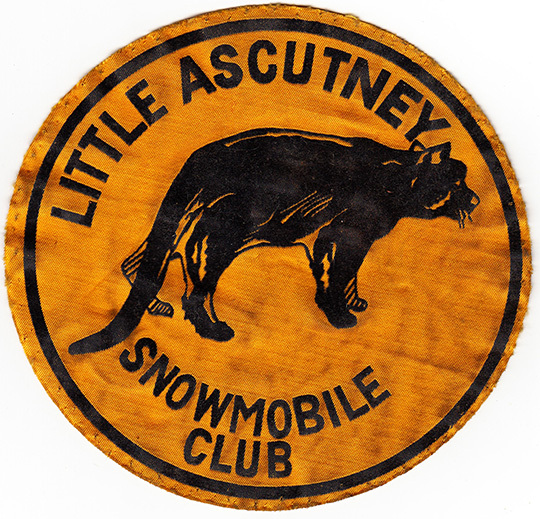 This 1950-60’s flocked pennant is a beauty with the badass Catamount mascot. 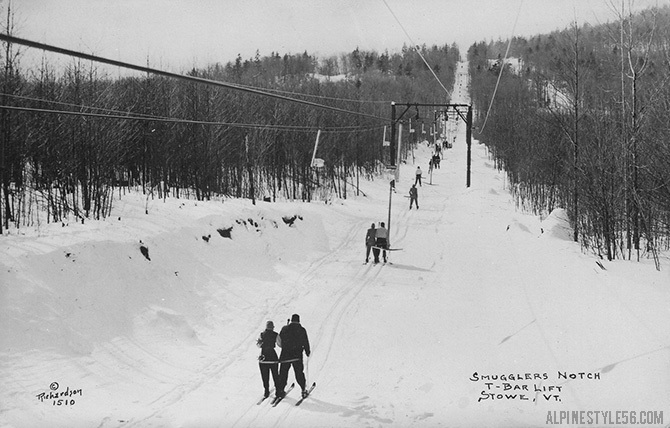 Real photo postcard of the Smuggler’s Notch T-Bar at Stowe, Vermont. I have been looking for this specific image to add to my Richardson collection! 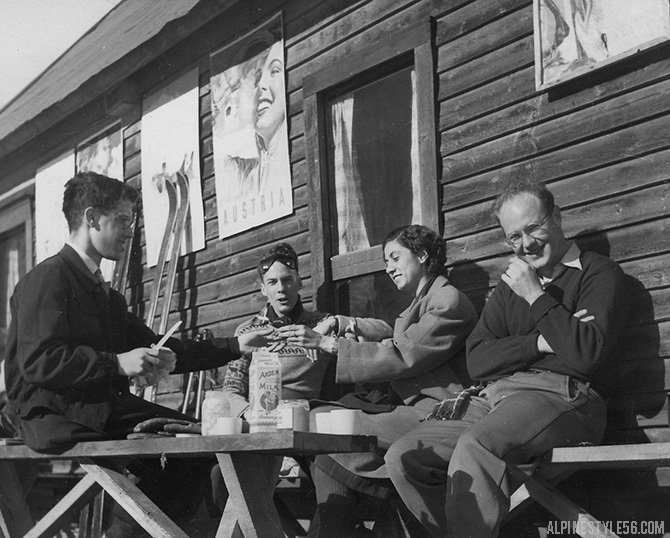 Photo by Harry Wendell Richardson of Newport, Vermont. 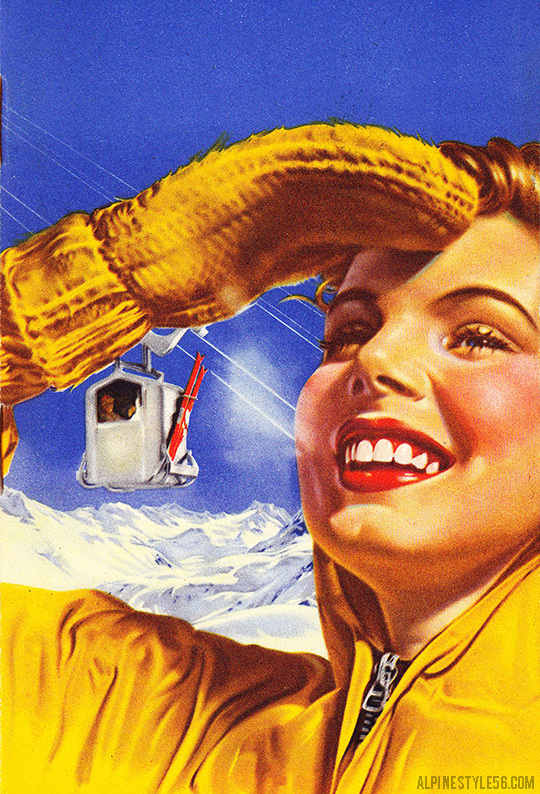 I love the vibrant color of vintage Photochrome postcards. This one was produced by the Union Pacific Railroad – such great composition. Apparently, I needed a little break from blogging and spent the extra time the past couple weeks riding my bike. 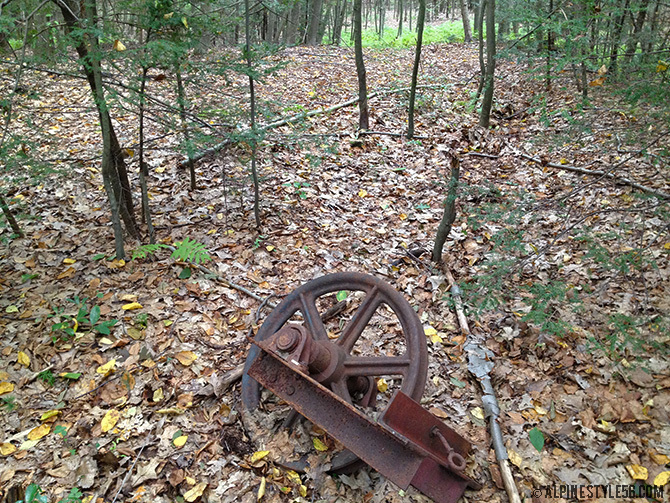 So this post is a week late but I still wanted to share a few photos from the excellent Deerfield Dirt Road Randonnée. 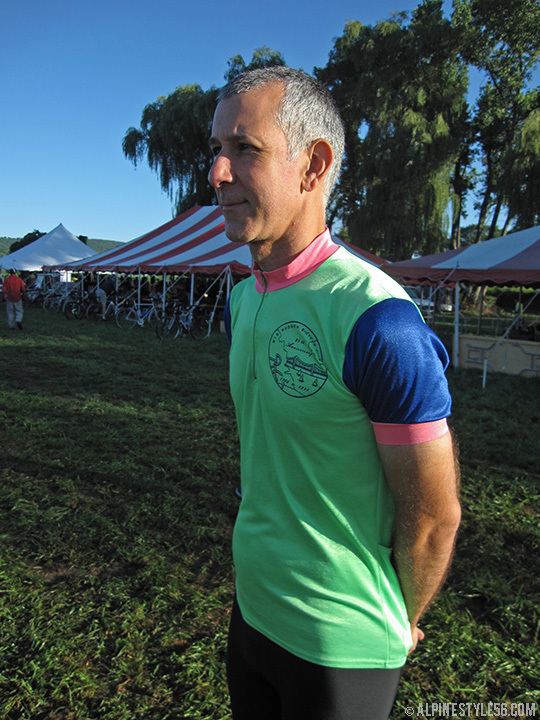 The D2R2 is a fundraiser for the Franklin Land Trust of western Massachusetts and has become known as a favorite New England cycling event. 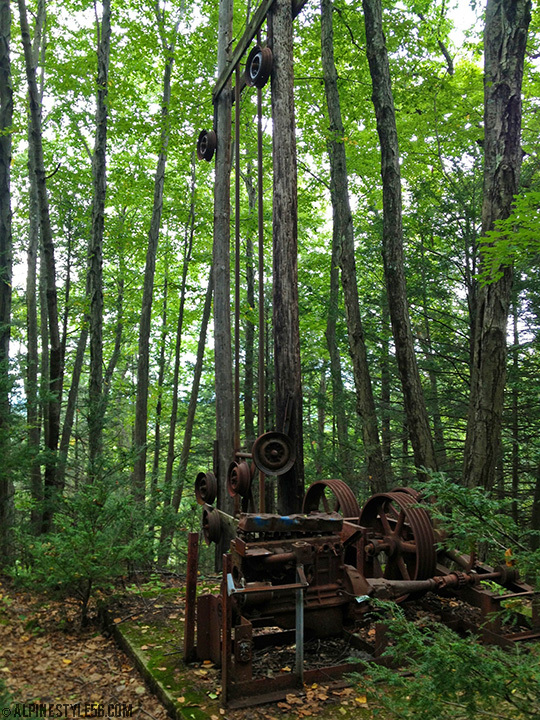 My husband and I rode the 115k loop and were not disappointed – a spectacular rural route running from Deerfield into southern Vermont with gorgeous vistas, wicked climbs, amazing event staff and the best weather imaginable. So many fantastic vintage cycling jerseys! I was more focused on riding than collecting photos but was fully engaged by the variety of kits — from the newest Rapha to classic Ibex wool to retro jerseys dusted off for this event. 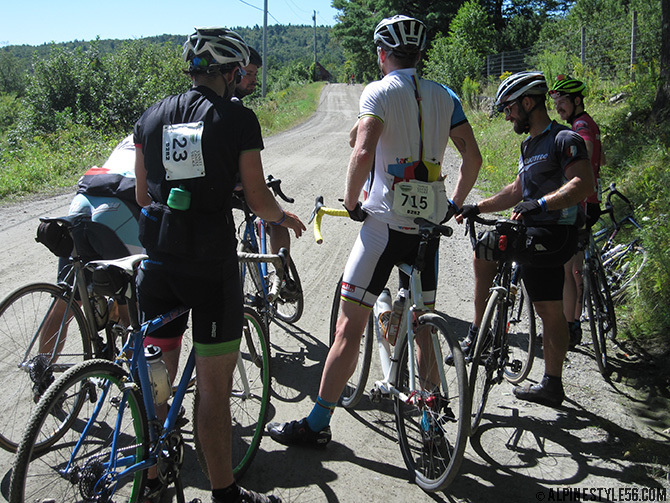 Mostly cyclocross bikes, some road bikes and a few of us on big fat mountain bikes. With four segments, tons of turns and landmarks – our simple DIY cue sheet holders worked like a charm. 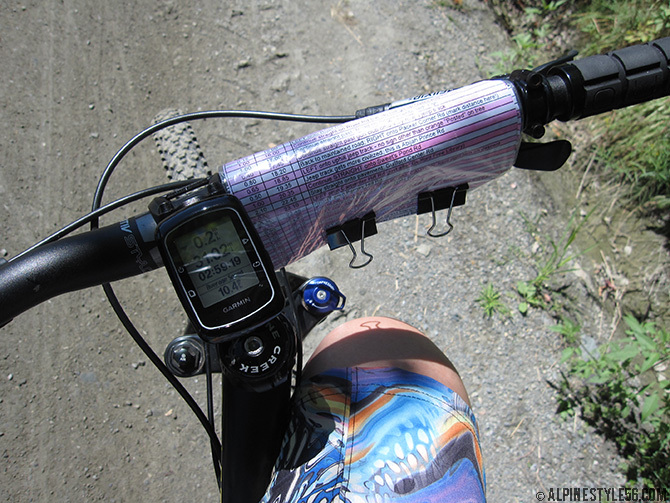 Thank you Shredly – my MTB shorts and YOGACHAM liners were super comfortable for the entire 72 miles – a much longer test than a typical mountain bike ride! 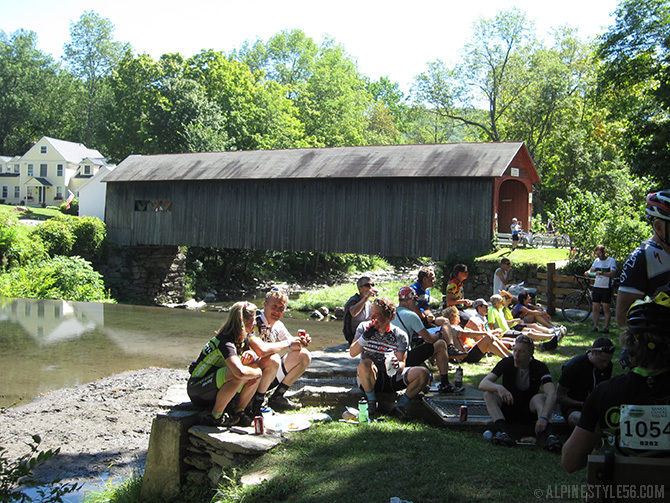 Lunch by the covered bridge over the Green River in Guilford, Vermont. It was so hard to leave this setting and get back on the road! You Got This! Great encouragement to have rolling with you – very needed for the Pennel Hill and Patten Road climbs! 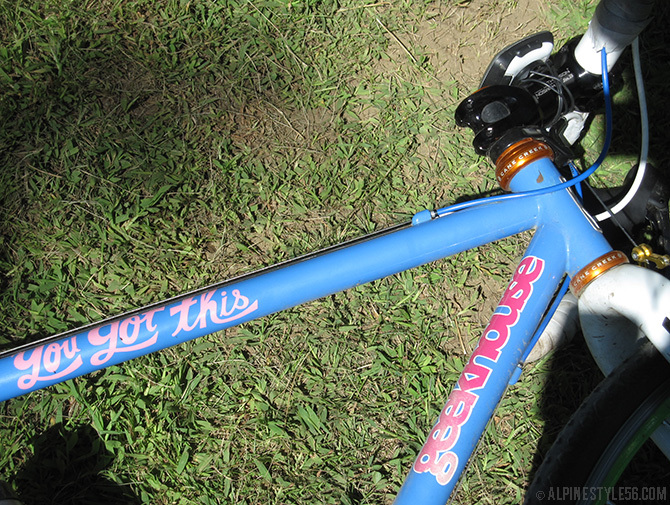 Check out the colorful style of Boston-made Geekhouse CX bikes. 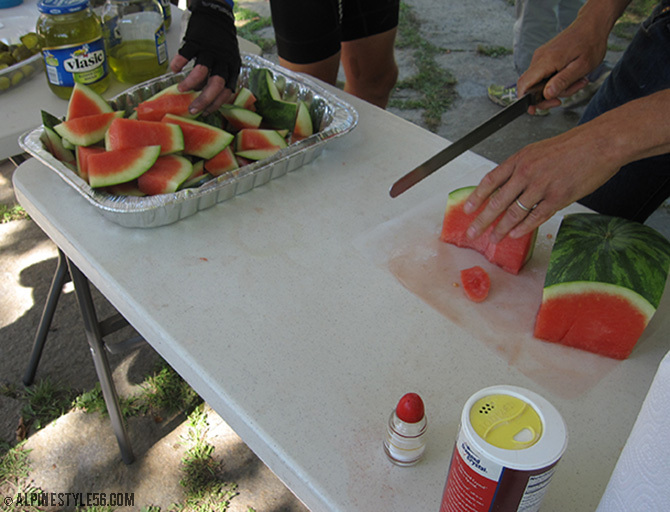 Salt on watermelon was new to me but hit the spot! Such nice rest stops and support, many thanks. 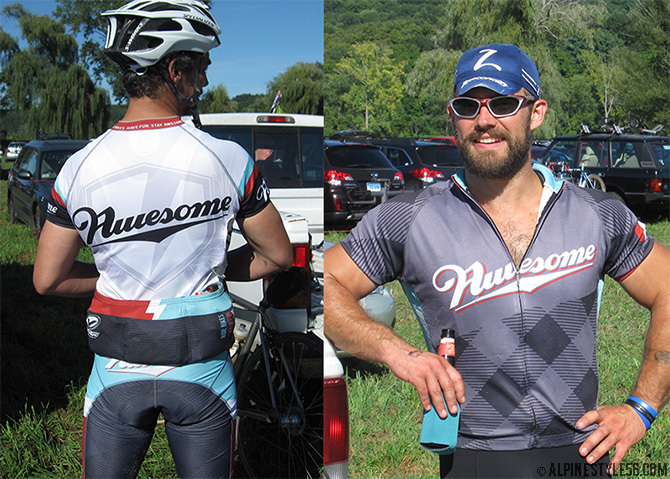 Team Awesome says: Ride Bikes. Have Fun. Stay Awesome. D2R2 was awesome!